An incredibly strong entry for the tournament this year, highlighting the strength and popularity of racketball within the County. 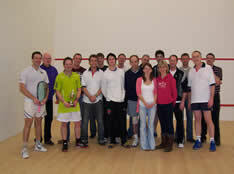 The tournament was kindly hosted by West Hants LTC club this year. The doubles entry in particular proved very popular, but the quality of entrants to the Mens Singles section drew many spectators to the tight matches played in the later stages. Both semi final matches and the final went to 5 games, with the winner in each case shading the 5th game by a margin of 2 points. 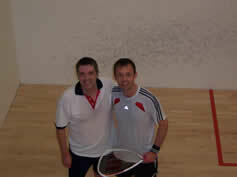 The Mens Over 40 championships had 17 entrants, the standard was such that there was not much to choose between the top 12 players. This led to some close and keenly fought matches, where inevitably some players more than others had the sting drawn out of them as they reached the next round. Last year’s champion Phil Dominey was dethroned in the final by the fittest man in the tournament Simon Brown, who ended up a worthy winner by 3 games to 1. The Ladies championships unfortunately only had 3 entrants with the winner being decided on a round robin basis. 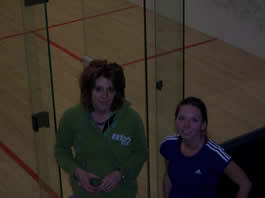 The deciding game turned out to be the one between Vikki Jarvis and Bev Vatcher (holder of 2 National Over 40 crowns). Despite Vikki going 2 games to 1 up, she could not quite cross over the finishing line and Bev won an absorbing contest 3-2 to retain the Dorset Ladies title. Debbie came 3rd ! The Mens Singles championship possibly contained one of the strongest individual entries that any County could put together, arguably containing 5 of the top 20 players in the Country. A fit and tenacious Alexis Smith narrowly lost 11 – 9 to Andy Corben in the 5th game in the 1st semi final on Sunday morning, whereas the large gallery was equally entertained by the other semi final on the adjacent court between Neil Chambers and Theo Woodward. In this one Neil just edged out Theo, again by the score of 11 – 9 in the 5th game. Both games could have gone the other way with a bit of luck or inspiration, but the top 2 seeds had made it into the final. 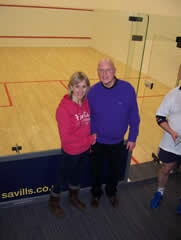 Defending champion and home club coach v the higher ranked (nationally speaking) Neil Chambers ! Again the game did not disappoint and credit must be given to both players for the number of games that they played over the weekend and still managed to put on such a high quality final. After a see saw match, Neil managed to edge Andy out 11 – 8 in the 5th, as tiredness started to creep in. 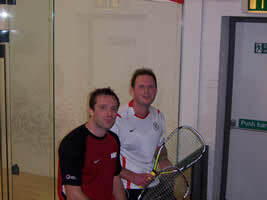 Neil and Andy straight after their Mens Final ! The Doubles section had 17 entrants split into 4 boxes with an A and a B section, the top 2 pairs in each of their boxes playing each other in a semi final and then final. Due to the length of the games, all matches were played on a best of 3 basis. Such was the popularity of the event that entries were received from Portugal and it did not hurt that it was Mark Hurd’s 50th birthday celebrations on the Saturday night. 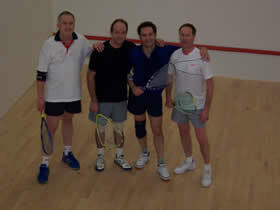 The B final was won by Malcolm Barnes / Nick Aubin, who beat Nic Moreton and Alex di Re by 2 games to 1. In doing so they reversed the result from their earlier game in the box league qualifier. 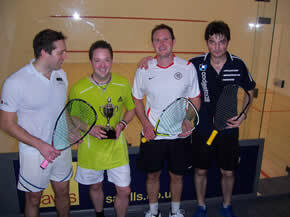 The final between Andy /Theo and Neil Chambers / Mike Ypes could have gone either way but a a great piece of sportsmanship from Andy at 8 all in the final game eventually proved crucial. Andy felt that a let they had been given was not entirely justified and hence deliberately tinned the service. Sometimes the psychological effect of this can work in your favour, but in this case Neil and Mike scented victory and closed out the match 11-8. The large gallery reminded people of the interest shown in squash 20 years ago and this game certainly seemed to catch everyone’s attention ! Finally, a huge thanks to our sponsors Stewart and Co (Accountants), but just as importantly all the players who largely turned up on time and enjoyed themselves so much over the weekend. 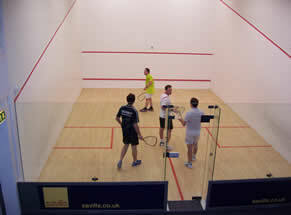 Racketball is alive and kicking in Dorset !! Good luck to our County team playing at Lee on Solent in the National Finals on the weekend of 19th/20th Feb and their attempt to retain the trophy they won last year. Also, good luck and keep in training (!) to all those players entering the National Championships in May – Dorset normally gets about 20+ of it’s players going up there each year and the numbers are growing ! 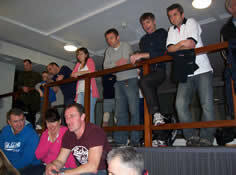 …some of the contestants ……a captivated gallery ! See you back again in 2012 ! !